Money’s tight these days, so choosing a cheap four-season (or three-season) tire is a tempting proposition. Sure, they often look nice and may offer what seems to be adequate performance, but they quickly reach their limit when you take corners or brake, especially if you’re unforgiving with the steering wheel or pedal. So if you cover several thousand kilometres per year, choosing tires shouldn’t be taken lightly. To give you a helping hand, we tested several entry-level tires on a Mazda CX-5 and came up with a top ten list of affordable tires for compact SUVs. The tires listed can be used on subcompact, compact and midsize SUVs or crossovers. Depending on the sizes offered, some tires are also suitable for full-size SUVs or pickups. The size we chose for our test was 225/65R16 – the most common on the market. Also: Cooper Weather-Master WSC: Affordable Performance? Regardless of our suggestions, bear in mind that you should always choose a product that suits your needs in terms of budget, vehicle type, driving style and the number of kilometres you travel every year. When in doubt, talk to an expert and explain your needs. An informed consumer will ask the vendor to suggest at least three models (good, very good and best), and ask for explanations of the product characteristics and differences. As in our other test to determine the 10 best all-season tires on the market for compact SUVs, we asked tire manufacturers to provide us with the product that they would recommend for a Mazda CX-5 or a vehicle in the same class. We evaluated the tires on various smooth, uneven and cracked asphalt and concrete surfaces. As per usual, the tests included accelerations and braking, successions of various types of turns, lane changes and slaloms. Here are our rankings. The Sincera SN250 A/S could have easily ranked in our top 10 best tires that we tested this spring (see the other comparison). But since we wanted to do it justice, we included it in our affordable tires test instead—and it came out the winner. It’s a well-deserved honour for a tire that offers the highest quality for price on the market. During our testing, the rubber gripped well in turns and, when braking, stopping distances were respectable. But the stability was came up short compared to well-known tires. Longevity won’t be a problem if you don’t overdo it. The Falken brand belongs to Sumitomo, which is one of the largest and oldest Japanese industrial conglomerates. Although it has earned higher marks in our previous rankings, the AltiMAX RT43 still came out with a strong finish during this test. True, it isn’t blessed with the latest technology, but it’s a safe bet that will be able to give you loyal service nonetheless. It goes without saying that we’re looking forward to the arrival of a new generation¾derived from the Continental ContiCrossContact LX 20 (General Tire belongs to Continental) ¾but its price range will be higher. Our main reason for liking this tire is that it’s sold at an affordable price. The RT43 is a sturdy tire able to support heavy loads. But on the road, the noise level, traction in turns and braking distances are a notch below renowned tires. Uniroyal is a subdivision of Michelin. So as not to compete with the flagship brand’s products, Uniroyal tires use old technologies developed by Bibendum. But to revitalize its entry-level brand, Michelin allowed Uniroyal to launch new products, such as the Tiger Paw AWP3. Made in Taiwan, the Tiger Paw AWP3 is the product that surprised us. Equipped with a square shoulder and a conventional tread, this tire delivers better handling and a more silent ride compared to previous generations. However, the promised longevity (rating of 660) remains unproven. Made in Quebec at the Firestone plant, the Destination LE2 is showing its age and lagging behind from a technological standpoint compared to the competition. Fortunately, a new generation is supposedly in the works. Designed specifically for SUVs and pickups, we like it for its pleasant everyday ride. A robust carcass helps it support heavy loads and take on rough terrain or construction sites. On the other hand, potholes or bumps in the road can be brutal.Handling on dry or wet surfaces is decent, but not exceptional.Braking distances are longer than those with the equivalent tires from parent company Bridgestone that are sold at a higher price. The GT Radial’s Champiro Touring A/S is a decent tire that offers good value for money. This tire’s main quality is the ease with which it expels water via large longitudinal grooves. On dry pavement, the ride is smooth but stopping distances remain a little on the long side. When pushed to the limit on corners, the tire’s traction is predictable and progressive. Made by Nexen, the Terra Trac Cross-V is a new model from Hercules. Despite its padded technical data, we expected more from it. 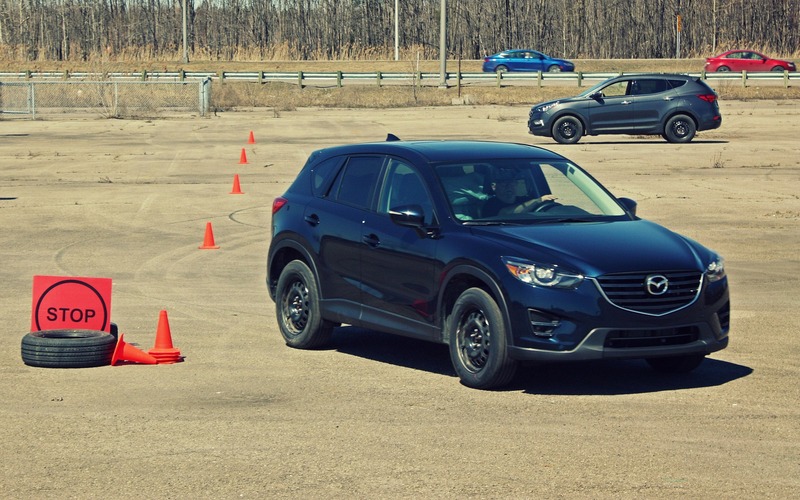 During our testing on the Mazda CX-5, it lacked precision in turns and its braking distances could definitely have been shorter. Because of its solid design (it is also offered in an LT version for pick-ups), it suits mid- and full-size SUVs much better. Having said that, the ride is smooth and you still get good quality for the price. Cooper is an American manufacturer that has a good reputation in the United States.Here in Canada, this brand is a relative unknown that deserves some attention.The Discoverer SRX held its own during our testing, but we thought it would finish higher in our rankings. While the design seemed promising, we were hoping for better from the tread’s grip in turns, although the handling remained progressive and predictable. We would have appreciated a smoother ride over potholes but we liked the SRX’s stability at high speed.The longevity (treadwear rating of 740) and the price are the main assets of this typically American tire. Westlake is a trademark of the Chinese company Hangzhou Zhongce (ZC-Rubber), which is the China’s largest tire manufacturer. Westlake products are decent, especially if you take price into consideration. This latest generation of SUV tires includes more recent technology, proving that the brand is working to improve its products. The tread is simple and does a good job of evacuating water. Handling, braking and stability are just average. To conclude our ranking, we decided to use the 9th and 10th places to introduce you to a new type of tire that aims to work in all weather conditions. This type of tire is approved for summer and winter, as evidenced by the icon that shows both a mountain and a snowflake. All-weather tires are designed to take over where yesterday’s four-season tires left off by allowing you to drive in Quebec 12 months per year. They don’t come cheap, but using them will save you time, plus the money spent mounting and removing tires twice a year. What’s more, you won’t need to buy steel wheels for winter or to store tires in the off-season. The Nokian WR G3 SUV could have topped our out-of-category rankings, but we ruled it our due to its higher price. Thus, the Toyo Celsius CUV comes in 9th place in our Top 10. It features malleable rubber that adapts to the road conditions, as well as extreme summer and winter temperatures. It wicks water away efficiently since it is also designed to excel in the mud. Buyers will have to rotate the tires as indicated by the manufacturer to maximize the product lifespan. This tire is especially suitable for drivers don’t rack up too many kilometres and is quieter than four-season tires thanks to its aggressive design. Finally, because of the rubber composition, you can expect braking distances to be longer in winter and summer. The Yokohama Geolander A/T GO15 is a new product that joins the new all-weather category, which allows you to keep the same tires on year round. The A/T GO15 demands a smooth, even conservative ride in winter conditions since it doesn’t have the traction of a true snow tire. It’s much better in summer provided you don’t push it to the limit—its rubber could quickly deteriorate. It features a reassuring treadwear rating of 600. The Geolander A/T GO15 is a good compromise and proves far superior to classic four-season tires. * The author would like to thank Michel Poirier-Defoy for his expertise and invaluable cooperation in the completion of this comparison. Our most sincere thanks also go to Mazda Canada for lending us the CX-5s, Albi Mazda for lending us the replacement rims and Atelier Yvon Lanthier for storing, mounting and removing the tires. Uniform Tire Quality Grading (UTQG) is the tire rating system that provides the following information: treadwear, traction and temperature. Every manufacturer does its own testing according to legally-established standards and then awards a UTOG grade. This rating is found on the sidewall of tires and is used for comparison purposes only. It does not constitute a guarantee. Treadwear: According to tire industry standards, a rating of 600 means that a tire will wear twice as slowly as one with a 300 rating. The higher the rating, the longer the life of the tire. Traction: The traction rating indicates tire grip on wet pavement. The maximum rating is expressed by the letters AA, followed by A, B and C. B is the minimum acceptable rating and C-rated tires should be avoided. Temperature: A is the highest rating and it designates a tire’s resistance to heat and its capacity to disperse heat in intense use. Consumers should accept no less than a B rating, and avoid products that scored a C.
Tires Cooper Weather-Master WSC: Affordable Performance?